Left: Prairie Dog Knoll, Abajo Mountains, Utah, August 17, 2009. 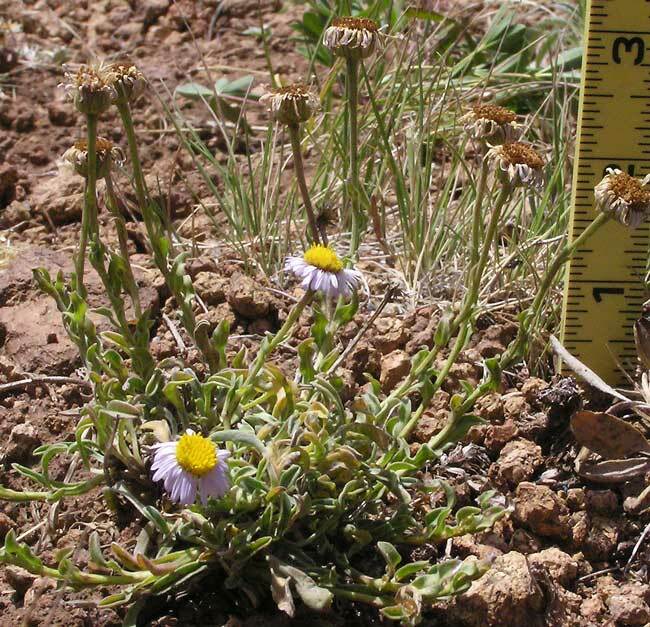 Erigeron abajoensis is a rare plant known, as the map below indicates, from only a few counties in the Four Corners area of Utah, Colorado, and Arizona, but rarity, like most other aspects of our world, is a matter of place and time and circumstances. On the knolls where the photographs on this page were taken, this plant abounds. E. abajoensis grows from two to fourteen inches tall with stems that often recline and then ascend (as shown in the photographs on this page) or with stems that are sometimes erect. The plant grows with tight, mounded clusters of basal leaves which are oblanceolate. Stem leaves tend to be smaller and oblong or lance-oblong. Both have a single vein. 1) E. leiomerus almost always has glabrous stems and leaves; E. abajoensis has hairy stems and leaves. 2) E. leiomerus is far more widely distributed than the rare E. abajoensis and although the two species enjoy similar habitats, they only rarely occur in the same regions. 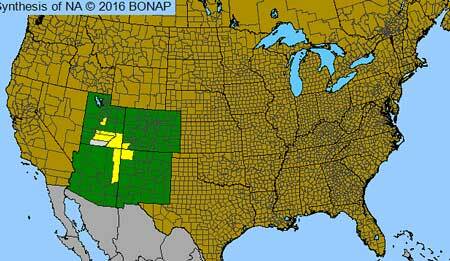 See the distribution maps for the two species at the bottom of each page. 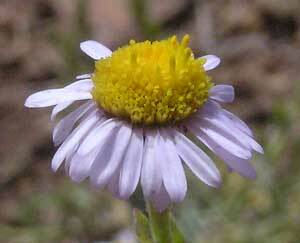 3) E. leiomerus is found from 8,400 feet to 12,000 feet; E. abajoensis is found from 6,500 feet to 10,800 feet. 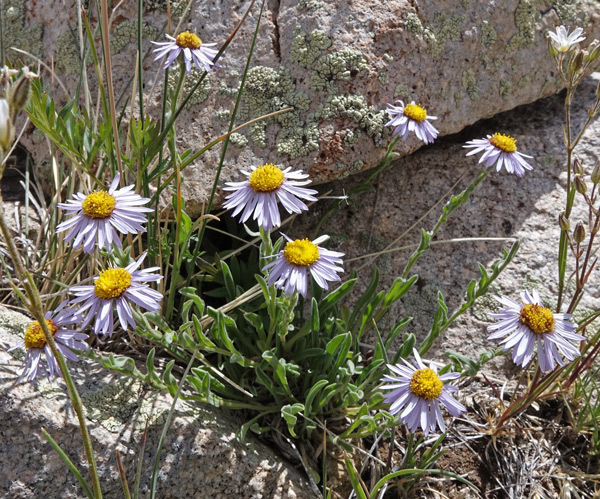 The photographs of E. abajoensis on this web page were taken on Prairie Dog Knoll at about 9,800 feet and above the high point on the Robertson Pasture Trail on an unnamed knoll from 10,600 feet to 10,800 feet. 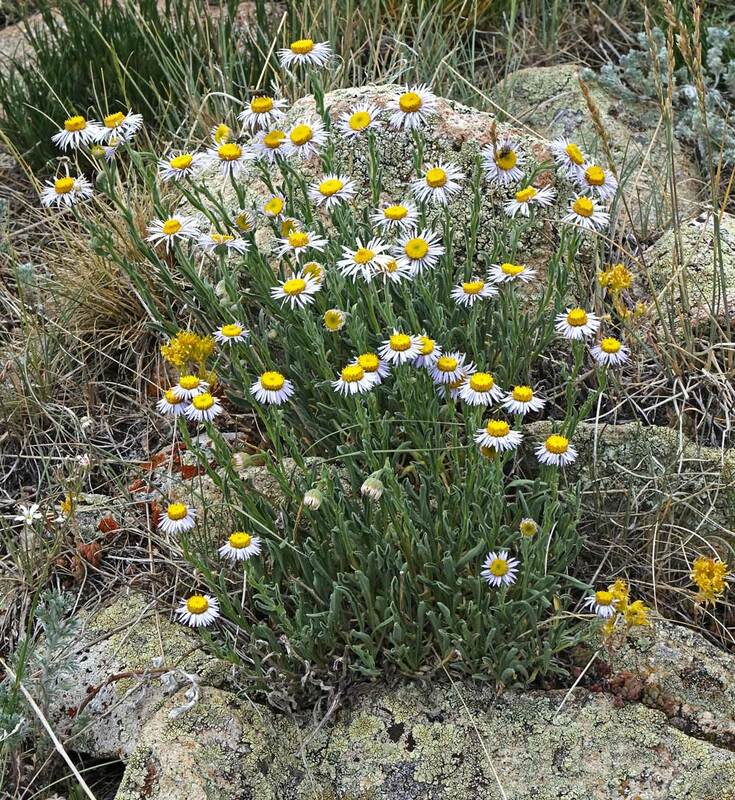 Rydberg and Garrett found the plant in 1911 in the Abajo Mountains, but for some reason it was not named and described until 1947 by Arthur Cronquist. Prairie Dog Knoll, Abajo Mountains, Utah, August 17, 2009. Ray flowers are often reflexed (bent downward), short, and vary from 3 to 8 millimeters. Rays in the photographed flower heads are about 5 millimeters long. As the last photograph at left shows, phyllaries are in 2 or 3 nearly equal length rows, but you may find them in equal length rows. 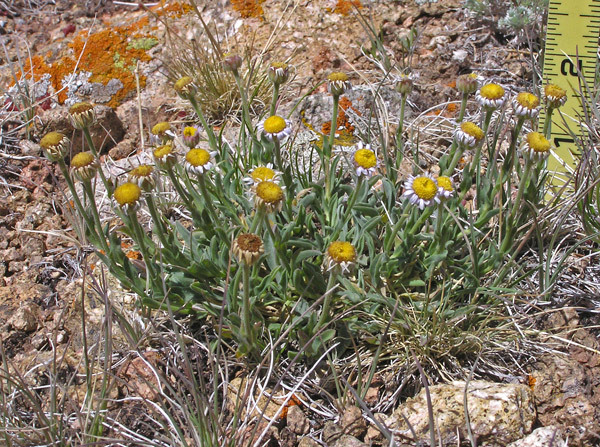 The phyllaries are thickened in the middle, and often green with tan margins and reddish tips. 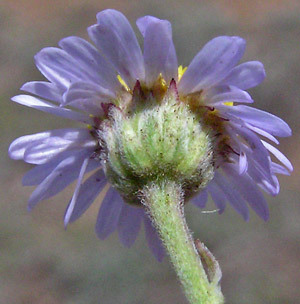 Hairs on the phyllaries are white and multicellular. 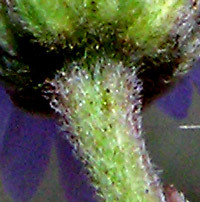 Hairs throughout the plant, but especially on and just below the phyllaries, are often crinkled or bent backward at their tip.